MINETTO – Several Minetto Elementary School teachers took advantage of pairing up with classrooms from throughout the country, in celebration of Dr. Seuss’ recent birthday. 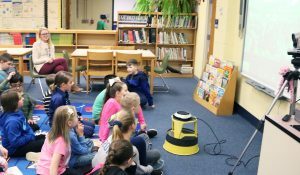 Students in Stacie Roberts’ fourth-grade classroom at Minetto Elementary School participate in a Read Around the Planet video conference with a Texas classroom. Several RAP sessions were offered for multiple Minetto classrooms, in celebration of Dr. Seuss’ recent birthday. The Read Around the Planet connections brought Minetto classes together with new places and people, all while sharing a love of literacy. Library media specialist Kimberly LeRoy said the experiences also were an opportunity for students familiarize themselves with different parts of the country. Students in Stacie Roberts’ fourth-grade classroom learned similarities and differences between communities near San Antonio and Houston, Texas versus Puerto Rico. One of the Texas students also read excerpts from a poetry book one of their teachers wrote to help raise money for recent hurricane victims in Puerto Rico. Minetto students that destruction had once plagued both locations, and they were excited to share that they, too, learned about native cultures, having recently studied the Haudenosaunee. There was plenty of time for questions and brief explanations of the classroom’s surrounding community. The Minetto fourth-graders took turns sharing information about the school district, city and local gems such as Fort Ontario. The connections were made possible thanks to the Center for Instruction, Technology & Innovation’s Distance Learning program, in partnership with the Oswego City School District’s technology department.